Less than one tenth of one of the richest bio-diverse tropical forests in the Western Hemisphere remains: the Atlantic rainforest, an ecosystem once covered an area as great as the whole of California, Nevada and Arizona together, but now covers an area less than South Carolina. It is still being cut: in the decade of the 1990s an area the size of Delaware was cut. The reason is that smallholder farmers are pushed by economic necessity to maintain their income levels in the only way they know: increase the land cultivated – cut down the forest. Iracambi aims to confront this threat by making conservation of the forest more attractive than its destruction. 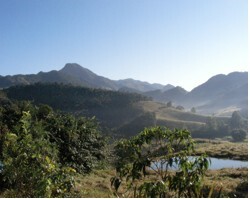 Iracambi is located in the Serra do Brigadeiro, in the highly endangered Atlantic Forest area of Minas Gerais. Smallholders privately own most of the forest and they face the same challenges as the rest of the community they live in: how can they make a living with what they have, while conserving our globally important biodiversity? From its original roots as a farm, Iracambi has grown to include a whole gamut of different activities that seek to find solutions to the problems caused by the unsustainable way the environment was being used: reforestation, GIS surveys/information gathering, land use management, conservation, alternative income generation through Medicinal Plants, and community education and outreach. Instead of ignoring the complex causes of forest destruction, Iracambi works in the belief that unless something is done to address all of the issues that have brought this situation about, nothing will improve. Iracambi is in great need of a clear coherent communications strategy so that the Iracambi story is consistently and attractively told in all of the areas of their work and to all of their current target markets.